From coast to coast we’ve searched to find some of the quirkiest, interesting, original, and of course delicious food trucks around. Each day we’ll introduce a new truck and let you discover why it made it to our list. Not only are food truck owner Kurt Beecher Dammeier’s pork sandwiches delicious, but the truck’s appearance is sure to stop traffic. 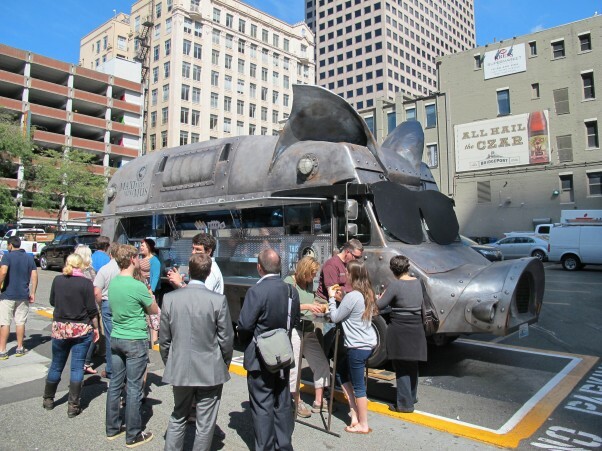 PBS Food caught up with Kurt of Maximus/Minimus to learn more about the story behind this unique Seattle food truck. What was the motivation behind Maximus/Minimus? 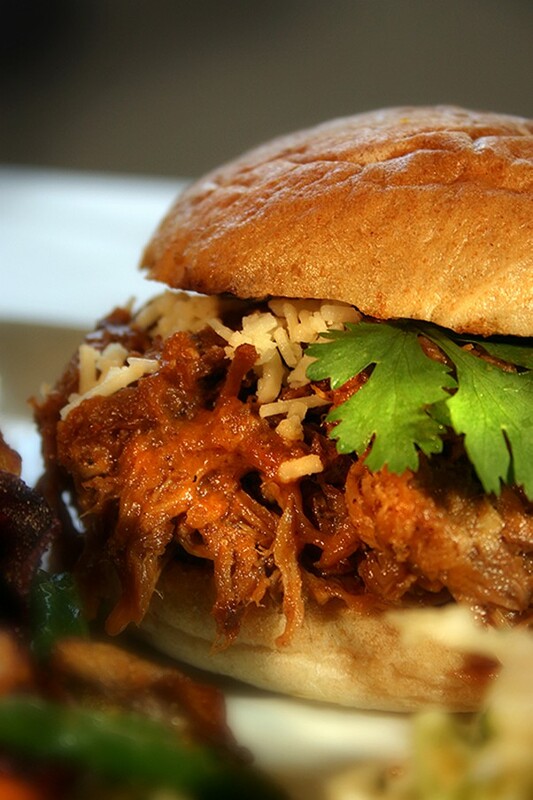 The idea started in 2008 when I was making pulled pork sandwiches to feed the office. The sandwiches became a popular request, and the employees discussed how great it would be to have a place close to the office where they could get the pork sandwich every day. I looked for availability around the Pike Place Market and, specifically, for a space that would accommodate a walk-up window. Unfortunately, nothing was available so I turned my sights toward the parking lot at the corner of 2nd and Pike streets in downtown Seattle – just a half block from the office. I was also thinking of a name for this new business. I have a son, Max, who I had nicknamed Maximus. I thought how cool it would be to offer these sandwiches with the yin-and-yang of flavor profiles: Maximus for spicy and Minimus for sweet. And thus the business was called Maximus/Minimus. 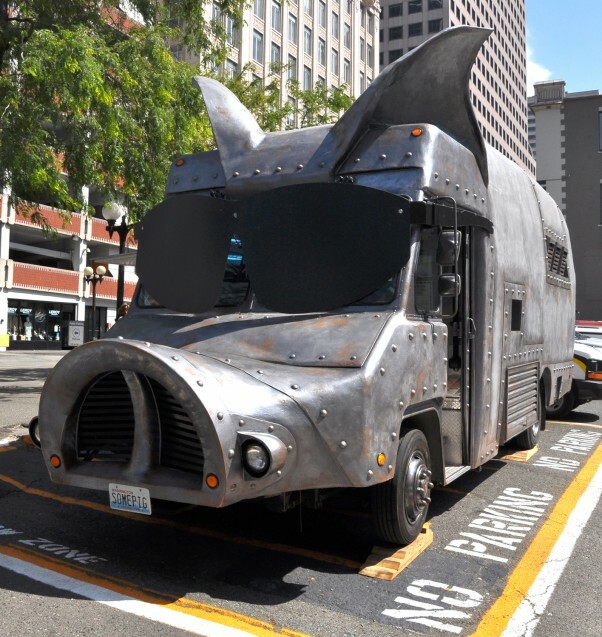 It was a wild ride to turn the truck into an “urban assault pig.” Working with a local Washington designer, the pig truck met my vision of being cool and unexpected without being ridiculous. The truck opened for business in June of 2009. It’s open every summer from April to October, and “hibernates” for the winter. First off – Maximus/Minimus is not barbeque. The sauces (Maximus and Minimus) are more about capturing that spicy and savory profile to fit the mood and hunger of the customer. Besides pulled pork, customers can order a number of items either Maximus or Minimus: grilled chicken sandwiches, vegetarian sandwiches, slaws and drinks. We also serve “Max and Cheese,” which is a version of Beecher’s “World’s Best” Mac & Cheese (I also own Beecher’s Handmade Cheese), but with Maximus sauce, and a spicy posole. What are some of the challenges and advantages with operating a food truck as opposed to having a traditional restaurant? The advantage is that we didn’t have to wait for a brick-and-mortar space to become available to launch the business. Once you have the food truck, your business can be opened at any time. A disadvantage is simply finding a place to park, but we’ve found that our best way to handle this is to work with private owners who either invite us to park on their lot or rent us some space. Another disadvantage is storage on the truck – if you run out, you run out. Location is very important, particularly in place like Seattle where weather is not always on our side. You need to be close to where the people are… and not just a bunch of people, but a bunch of hungry people. Do you have a few words of wisdom for anyone looking to start their own food truck? Make sure you have all your T’s crossed and I’s dotted with the food truck and health inspectors before you get too far into construction. We worked with the inspectors the whole way to ensure we were always up to code. Order fulfillment speed is critical. Customers take notice of how long they have to wait after they place their order, particularly when they’re standing outside. Watch your social media. The biggest hurdle to being a food truck is letting people know where you are going to be and when, so always communicate your plan. Learn more about Maximus/Minimus and stay updated with news and their locations on Twitter and Facebook.